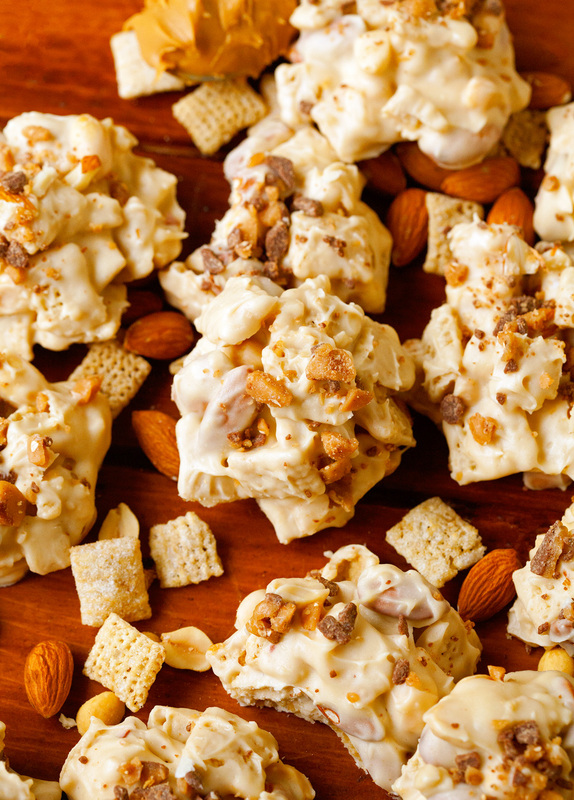 Peanuts, Almonds, and Cereal coated in a Yummy White Chocolate and Peanut Butter Mixture. Topped with plenty of Toffee Bits! Getting creative in the kitchen and coming up with fun no-bake treats, especially this time of year, makes me feel like a kid again. The only difference being that I am in full control of my ingredients and I don’t have my mom limiting me on how many treats I’m allowed. Being an adult can be fun, ha. Today’s recipe is the result of me being home alone for less than 24 hours. Adam recently had to travel for business, which meant that I had to spend an entire night on my own, entertaining our cats and trying to figure out how to cook a meal for one. Peanutty Granola Bars that are so easy to make and taste just like the real deal. 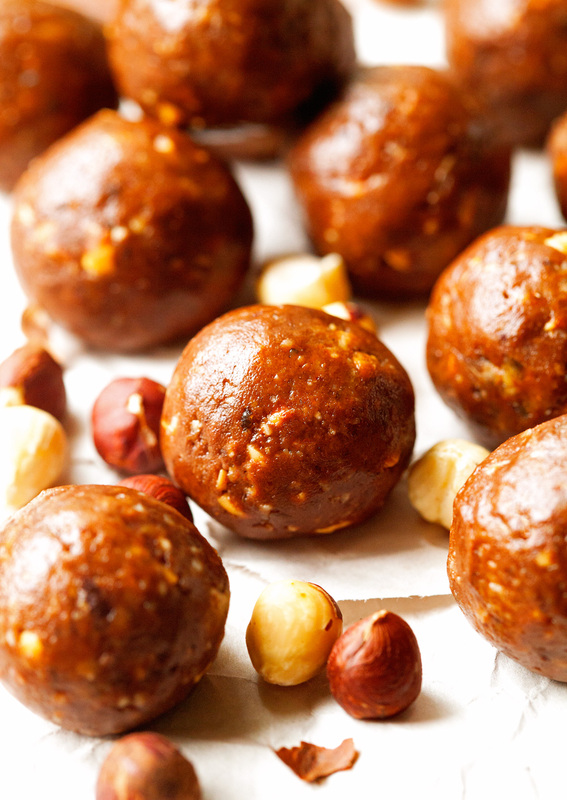 One of the best snacks you can prepare at home! 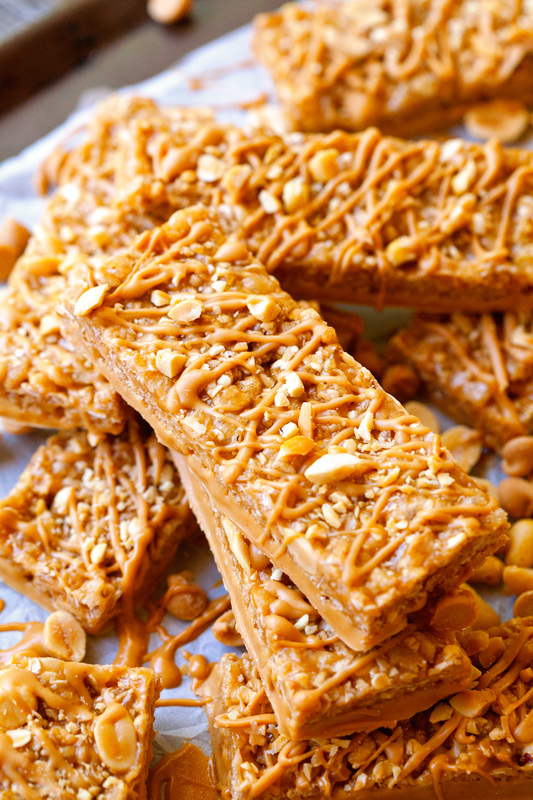 I hope you’re in the mood for some peanut buttery goodness today. Because the granola bars you see here are all about putting the spotlight on that dreamy little nut. 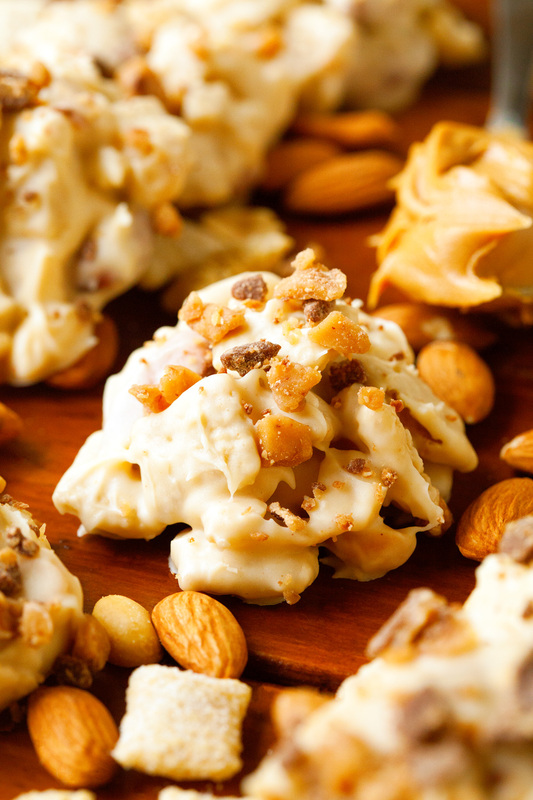 There are peanut butter chips, whole peanuts and loads of creamy peanut butter hiding in them. 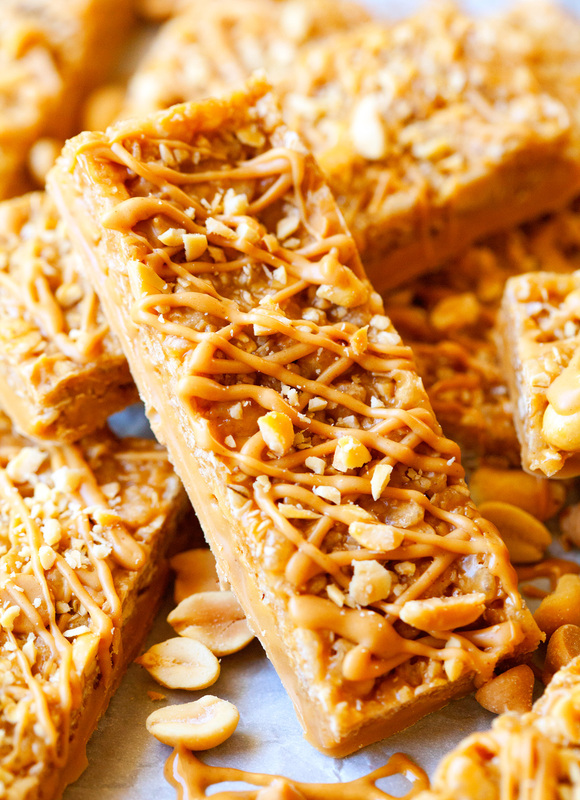 Plus, they’re dipped and drizzled with even more peanut butter. If you are not the biggest pb fan, I am truly sorry. I’ll make it up to you soon! For those of us that are huge fans of that amazing nut butter, you are in for the best granola bars you’ve ever tasted. And the best thing is that you can whip up a batch in the comfort of your own home with just a couple of ingredients in a matter of minutes. 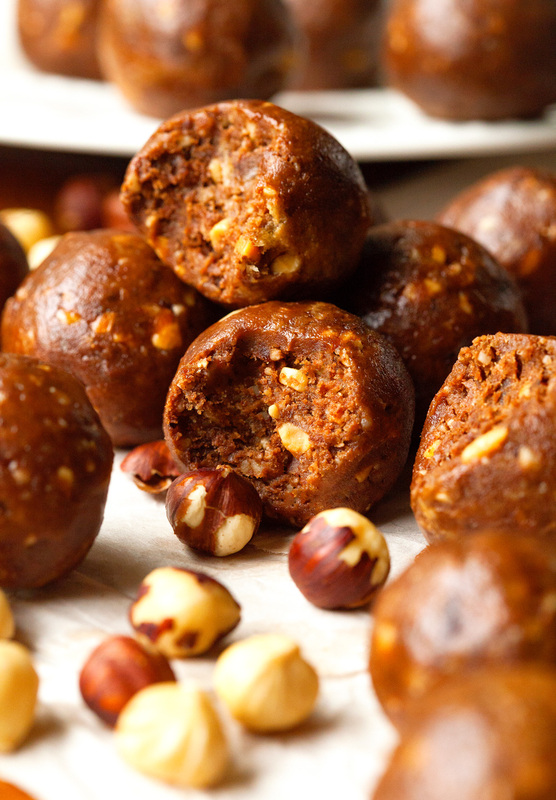 Healthy Energy Balls that taste anything but. Every Chocolate and Peanut Butter lover should save this recipe. Healthy snacks are pretty much an essential in our home. Adam and I have always eaten smaller meals throughout the day with a couple of snacks here and there. Not only do I like to make my own snacks, but I’ve really been concentrating on making healthy yet satisfying ones over the last couple of months. We’re still getting settled into our new home and have just a few projects (that require quite a bit of muscle work) left. So I decided to stock up our “good for you” options that’ll provide us with plenty of energy. And when I stumbled upon this new to me recipe, I knew instantly that I had to share it with all of you. This one’s simply too good not to. 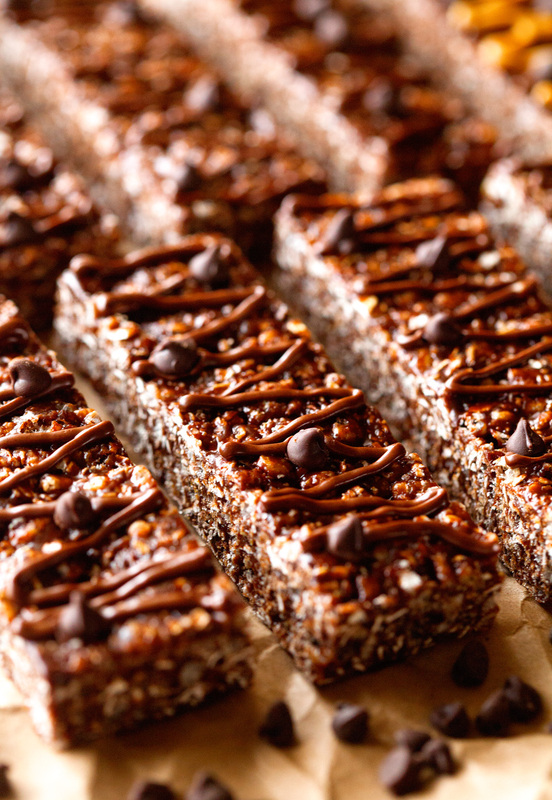 Make Chocolate Granola Bars in the comfort of your own home. 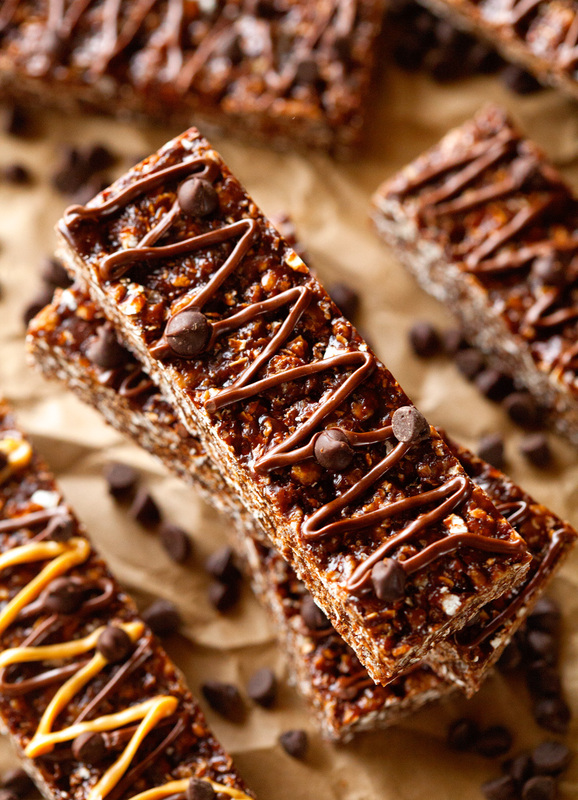 You will never want to buy another box of granola bars from the store again! It’s time for the weekend, everyone! Do you have anything fun planned? I think we’re ready to soak in the beautiful weather and let the sun do its magic. It sure is nice to feel the warmth and see the ground again (even though there’s not much to look at except for dead grass, ha). In preparation for our outdoor adventures this weekend, I started to get all sorts of ideas for snacks on the go that are wholesome and keep you fueled for physical exercise. Granola Bars were the first thing that popped into my head. Not surprising since they are the snack of choice for Adam and me. Those little bars always seem to satisfy and are just the right amount to hold me over in the afternoon or when I’m feeling a bit peckish whilst on a hike or after a run. 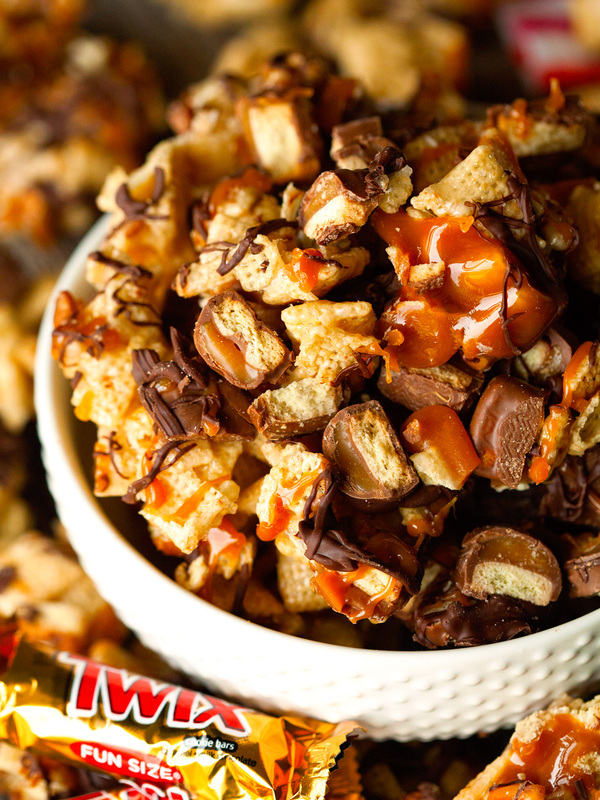 Twix Chex Mix inspired and packed with the amazing flavors of one of my favorite candy bars. This stuff is enticing, so consider yourself warned. We made it through another week, friends! Happy Friday. If you’ve been reading this blog for a while, you probably know how much I love to celebrate Fridays by now. The anticipation of the weekend and all the fun things ahead get me every time. And what says Friday night more than a good snack mix? 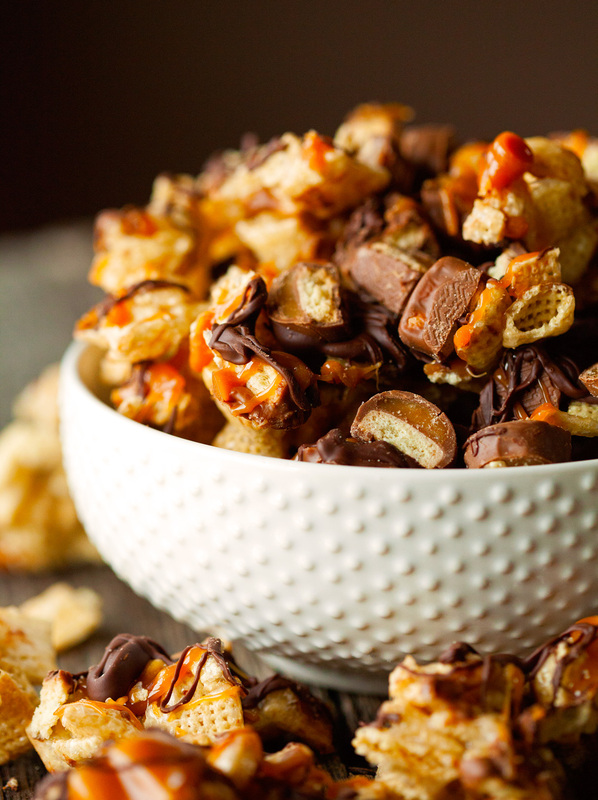 Whether you’re getting together with friends and need a snack to share or you’re settling in for a movie night, Twix Chex Mix may just be the ticket. I happen to adore Chex Mix in any shape or form. I fondly remember a few years back, when we were just married for a couple of months, my husband and I would load up on bag after bag of all the different kinds available during our weekly grocery shopping trip. Those were the days when I had no idea how to cook in any way, shape or form and Chex Mix tasted like the best thing on earth. We always wound up fighting over the Cheddar variety, right after there was no more Turtle Chex Mix to be found.